Image courtesy of the Ten Boom Museum Photo Album. 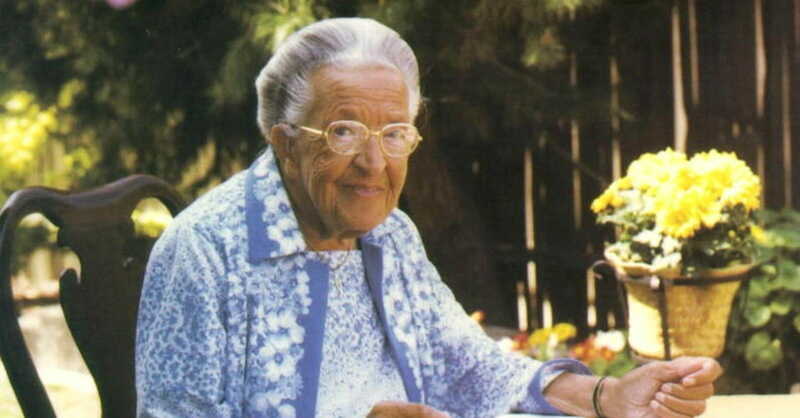 This past month on April 15th marked the birthday of the amazing woman, Corrie ten Boom. At the age of 91, on that very same date in 1983, she also passed into Heaven’s gates. According to Jewish custom, celebrating the same day for both birth and death is the unique sign of a very special individual. I think the rest of the world would agree. Corrie ten Boom was one of the godliest, soul-rich individuals I’ve ever read words from. Her deep wisdom came with the cost of journeying through great pain in this life, yet many of us have gleaned amazing nuggets of truth from her experiences. Evidence still that God uses all we walk through in this world for greater purposes and good, more than we could possibly ever imagine. The ten Boom family were Dutch Christians who helped many Jews escape the Nazi Holocaust of WWII. When their home was raided after an informant tipped off the Nazis of their activities, the entire family was imprisoned. Corrie and her sister were sent to a notorious Nazi concentration camp. She was miraculously released from prison just days after her sister had died there. God brought incredible beauty and healing through her difficult experiences, and her words still have great relevance and impact in our world today. She authored a number of books and was most famously known for The Hiding Place, the incredible story of her life. The title refers to the secret place where the family hid countless Jewish people needing help in their home and is based on this scripture, “You are my hiding place and my shield; I hope in your word” (Psalm 119:114). Certain themes run through her greatest quotes over and over again – truths we need reminding of in all we face today – Forgive, Love, Trust God, Don’t Worry, Pray. "You can never learn that Christ is all you need, until Christ is all you have." "Love is larger than the walls which shut it in." "This is what the past is for! Every experience God gives us, every person he puts in our lives is the perfect preparation for the future that only he can see." "Don’t pray when you feel like it. Have an appointment with the Lord and keep it. A man is powerful on his knees"
"If God sends us on stony paths, he provides strong shoes." "Worry is like a rocking chair: it keeps you moving but doesn't get you anywhere." "Faith sees the invisible, believes the unbelievable, and receives the impossible." Crosswalk.com: Leave It to Corrie Ten Boom to Change My Whole Perspective in Just 5 Encouraging Quotes from crosswalkcom on GodTube. Corrie ten Boom’s amazing life and journey remind us still today how to live strong and love well through the hope and freedom of Christ. May we press on in that wisdom, moving forward with the same forgiving spirit that typified this courageous soul. Don’t let the enemy hold you back. No matter what we walk through, God has good in store.